Pure Diamond Coin is the ICO from Pure Diamond Farm, which successfully produced a lab-grown diamond with the same chemical, optical, and physical properties of naturally mined diamonds. The Pure Diamond Coin lets investors become part of this project. The board of directors behind Pure Diamond Coin has a combined experience of more than 60 years in the diamond and jewelry industries. Before advancing in the project, the team behind Pure Diamond Coin confirmed that the there is indeed a market demand for lab-grown diamonds. It analyzed market trends and determined that there is a shift toward manufacturing and adopting lab-grown diamonds. Even large companies like De Beers have started adding these lab-grown diamonds into their product lines. Some buyers prefer the pricing and availability of lab-grown diamonds compared to mined ones, while others prefer the ethical nature of them since diamond mines are notorious for having poor working conditions. According to Pure Diamond’s research, the global diamond industry’s market value is $80 billion dollars. Synthetic diamonds are beginning to work their way into this market, and the Pure Diamond team feels that lab-grown diamonds will take over soon. The advancement of lab-grown diamonds is advocated by experts such as Neri Tollardo from Morgan Stanley. Tollardo argues that the demand is shifting to lab-grown diamonds and that by the year 2020, the industry of lab-grown diamonds will expand to five times its current size. Some other forecasts indicate that by 2022, there is a world market forecast of $27.6 billion for diamonds in industrial use and $50 million for use in jewelry. How Are Lab-Grown Diamonds and Naturally Mined Diamonds Different? The only difference between diamonds grown in a lab and those that occur naturally is how they are made. Both have a cubic crystal structure, a high thermal conductivity, and the same chemical formula, optical dispersion, refractive index, density, and Mohs hardness. This is a sharp contrast to other man-made diamond-like substances such as cubic zirconia and moissanite. The only one of the above categories that is the same for diamonds and cubic zirconia is their cubic crystal structure. In the case of moissanite, the only similarity with diamonds in those categories is the high thermal conductivity. What Else Should You Know About Lab-Grown Diamonds? Lab-Grown Diamond is actually a world-class appraiser, allowing them to get appraisal certificates with ease. 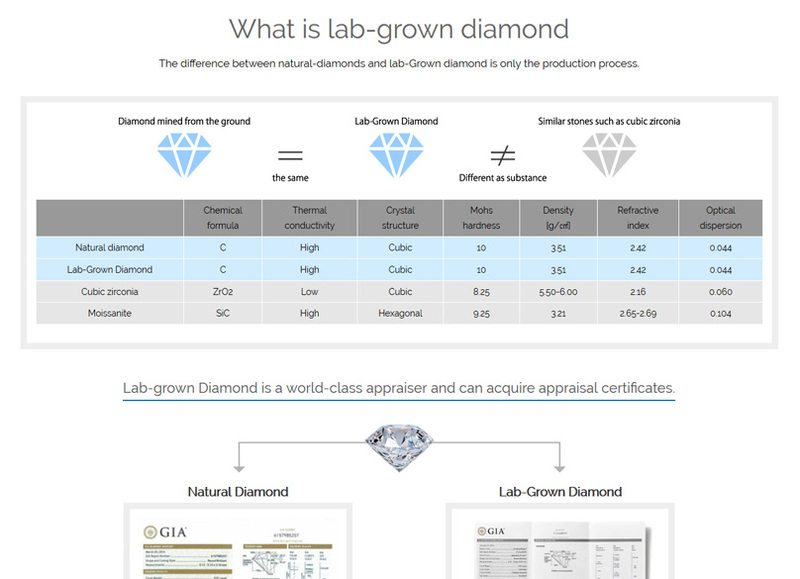 The appraisal certificates for lab-grown and mined diamonds are very similar, although the certificate does specify that the diamond is lab-grown. Pure Diamond Farm is careful to point out that its diamonds are not “synthetic.” Instead of synthetic diamonds, the Pure Diamond Farm recreates the exact conditions that diamonds need to form within the laboratory’s controlled environment. This allows for the production of real diamonds. How Does Pure Diamond Coin Use Blockchain? The Pure Diamond Coin project utilizes blockchain technology to provide traceability. The team stores all information on a peer-to-peer network, which is encrypted. Thanks to the use of blockchain technology, everything related to Pure Diamond is transparent and traceable. Because Pure Diamond relies on peer-to-peer encrypted functionality on the blockchain network, it is decentralized without any dependence on a central authority. This, in turn, allows for equitable communication and the ability to distribute information that cannot be falsified. Pure Diamond hopes to create its own blockchain infrastructure that will include constant improvements. Every individual diamond made by the Pure Diamond Farm gets inscribed on the blockchain network as a Pure Diamond Asset. These assets appear on the network, along with their own traceability and Pure Diamond Data certificates. Pure Diamonds have transparent transactions thanks to the aforementioned blockchain technology. Because of the transparent transactions and traceability of these lab-grown diamonds, it is easy to confirm that the diamond you purchase is not a fake. Additionally, Pure Diamond is able to sustain the value of lab-grown diamonds thanks to those transaction records combined with appraisal data. Users can view the information in a simple-to-process manner via the platform. The team at Pure Diamond also sees a great deal of potential for profitability. It points to the lack of stability in the value of Ethereum and Bitcoin due to the fact that those cryptocurrencies’ values depend on electricity consumption from mining. Pure Diamond Coin, by contrast, does not depend on mining, which the team feels should allow for stability. Since the token is issued in association with the actual value of a lab-grown diamond, the value of it is stable, allowing for a profit. The Pure Diamond Coin is built on the Pure Diamond Network and creates the token economy. The token economy will allow for the creation of rare diamonds. The team also hopes to expand the use of the Pure Diamond Coin in the future to settling services and goods on the network. There will also be a Pure Diamond Exchange, which is a decentralized exchange where users can trade the Pure Diamond Coin. In June 2018, the team designed the Pure Diamond Network and the digital asset system with the PDA token. In August, it will begin shipments of raw ore, order production equipment, and develop the Pure Diamond Network System 1.00, the decentralized Pure Diamond Exchange, the PD wallet, the settlement system with the PDC token, and the digital asset application with the PDA token. In September, it will begin sales of the Pure Diamond Type-0 test product following cutting and polishing. October will include jewelry exhibitions and securing the land for the manufacturing plant. The Pure Diamond exchange will open in December 2018, and in January 2019, it will announce the prototype of a fancy diamond (in color). 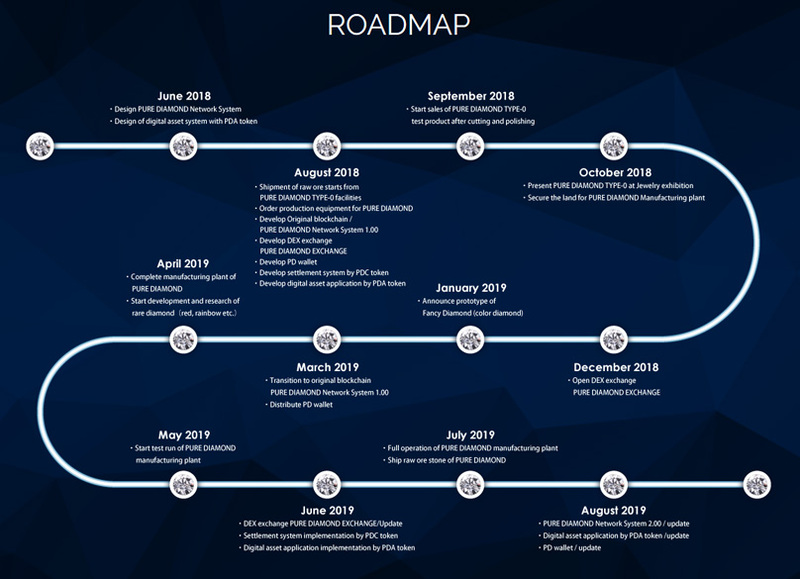 March will include the transition to Pure Diamond Network System 1.00 and distribution of the PD wallet. In April, the team will finish the manufacturing plant and begin the research and development of rare diamonds followed by a test run of the plant in May. The exchange will get updated in June, and the settlement system and digital applications will both be implemented. By July, the manufacturing plant will be fully operational, and in August 2019, the network, digital asset application, and PD wallet will be updated. Pure Diamond aims to enhance the diamond industry by filling the growing demand for lab-grown diamonds and utilizing blockchain technology. The pre-sale for the Pure Diamond Coin begins September 1 with the crowdsale ending on November 15.